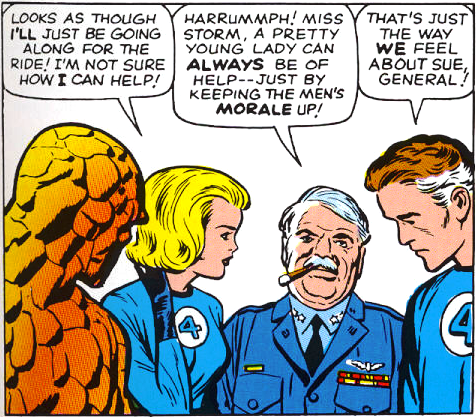 I don’t think “morale” was the word he was thinking of. These kinds of scenes make me wish for a “Mad Men” style series about the comic book creators of the 1960s. All the sexism, none of the fashion. Another classic case of trying to be appreciative of women…but not really knowing how. It’s like the way Ian Fleming wrote black people. Nothing like some good old fashion sexism to put superheroines in their place. Thanks, Marvel.